‘Fruit medium sized, obovate. Skin yellowish-green, but entirely covered with thin, smooth, cinnamon-coloured russet, and sometimes with a brownish-red tinge on the side next the sun. Eye small and closed, set in a narrow depression. Stalk three quarters of an inch long, inserted in a narrow, rather deep cavity. Flesh white, tender, melting, very juicy, sugary, and vinous. A first-rate hardy pear. Ripe in the end of October.’ [Hogg – Fruit Manual p.207/1860]. ‘This variety is very often confounded with the White Doyenné, already figured in this work. All the names cited above are undoubted synonyms; and it is exceedingly probable that the Doyenné galeux of Noisette's Manuel, page 526, is also the same: no difference has been found between fruit produced by a tree sent by him to the Horticultural Society, and the old Gray Doyenné. We think that this is scarcely so good as the White Doyenné, when that variety is taken at its best; but its period of perfection is so short that the Gray Doyenné, which will keep much longer, and which also possesses much excellence of flavour, may perhaps be considered the most useful.’ [PM t.74/1829]. ‘An ancient pear attributed to the garden of the Chartreux Monastery at Paris about the middle of the eighteenth century.’ [Pears of New York p.367]. Also figured in Saint-Hilaire pl.36/1828. 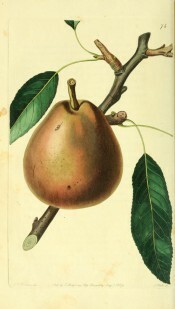 Listed only in the 1857 catalogue in an Addendum as ‘Doyenne Crotte’ [Pear no.54/1850]. ‘54. Medium size, melting, first rate.’ [Diary B, MP A2951/1862]. Obtained from Veitch’s Nursery, probably the original Exeter premises.